The Staff of Towers is an artifact crafted by the Ayleid arch-mage Anumaril around the time of the Alessian Slave Rebellion. It is composed of eight segments, each corresponding to one of the metaphysical Towers that shape the fabric of Nirn. No sooner was the Staff constructed than it was separated into eight pieces, seven of which were taken to far corners of Tamriel and hidden by White-Gold Knights. The eighth, made in the image of White-Gold, Anumaril himself wore as a femur while walking with other Ayleid refugees to Valenwood and the Tower of Green-Sap. There, he located the Stone of the Tower, the Perchance Acorn, and built an orrery around it, attempting to convert Green-Sap into another White-Gold to restore the Ayleid empire. This attempt failed, due to a fundamental incompatibility between Ayleid and Bosmer magic and belief. Centuries later, Arch-Prelate Fervidius Tharn of the Alessian Order dispatched agents to recover all eight pieces and reassemble the Staff. It was then used by the radical Marukhati Selective in an attempt to excise the Aldmeri influences from the Dragon God of Time, Akatosh. The wild ritual resulted in a massive Dragon Break, and once again disintegrated the Staff into eight pieces. The pieces slowly fell back to Tamriel as stars, and were the only means for those trapped in the Middle Dawn to chart the progress of time. Around 2E 583, the fragments of the Staff were located by the Psijic Order. The pieces were scattered all around Tamriel: the Adamantine and White-Gold fragments in High Rock, the Orichalc and Snow fragments in Hammerfell, the Walk-Brass and Red fragments in Morrowind, the Crystal fragment in Black Marsh, and the Green-Sap fragment in Valenwood. A member of the Psijic Order sealed time breaches around the continent, which allowed them to locate and retrieve the fragments. The reassembled Staff was subsequently stolen by Josajeh, a member of the Order who wanted to use the staff to alter time to reverse damage done to her family in the past. The Order managed to reclaim the Staff and exiled Josajeh. 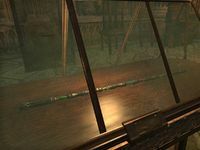 The Staff was subsequently placed in the Vault of Moawita on Artaeum. A partially translated Ayleid tract, The Remnant of Light, may describe the journey of one of the "White-Gold Knights". At a time of blood—possibly the Alessian Rebellion—an Ayleid lord is given an artifact by Anumaril and told to take it to the far northern reaches of Tamriel. However, this could also be referring to the Light of Life, the relic stored in the Doomcrag of Rivenspire which was eventually corrupted into the Lightless Remnant. The Staff of Chaos is another similar artifact that was split into eight pieces and scattered across Tamriel. However, this staff was not created until at least two centuries after the Staff of Towers, and was not disassembled until the Third Era. In early drafts of the Main Quest for The Elder Scrolls Online, the Staff of Towers played a key role in the story and was called the Balac, meaning that it was the same artifact as the Staff of Chaos. [UOL 1] This story was later scrapped and the Staff of Towers initially only appeared in the game by mention in some books, later appearing in the Summerset Chapter many years after launch. Terran's Notes by Terran Arminus — Sister Terran's notes on the visions showed to her by the Elder Scroll.